"Can two high school sweet hearts find their own happily ever after?" She wants to expand her wedding related business and he's the heir apparent to the family's bank. They're high school sweethearts who think they're over each other, but she's hiding a big secret that will change everything... Watch what happens in Happily Inc. when they have a business partnership! Silver has one last chance to get a business loan from a local bank. Unfortunately, the woman doesn't like Silver even though she's friends with her daughter and Silver's request is turned down. Drew is next in line take over the family bank and as well as Silver's high school boyfriend. They see each other in the lobby of the bank, and Drew realizes she didn't get the loan she needs to expand her business. Drew comes up with an idea to get close to Silver again, and also help her out: he wants to become her business partner. On a whim, Silver decides to go along with this idea, for the sole purpose of moving forward with her wedding company. Even though it's strictly business between them, they're both excited to spend more time together and get to work right away. 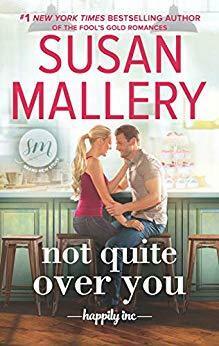 Susan Mallery's NOT QUITE OVER YOU is a heartbreaking but uplifting story about how when you find your one true love you can get a second chance to rekindle that relationship and that secrets, when finally revealed, can bring two people closer together. Come back to visit Happily Inc., the quirky small town whose livelihood pivots on true love, even for the residents of this delightful town. I want to visit this town many more times! Silver Tesdal has a head for business and a mouth made for kissing, and banker Drew Lovato has his eye on both. But ever since he was dumb enough to let her go, she�s kept him at a distance. When the bank turns her down for a loan, Drew sees a double opportunity�he can finance her brilliant, unique idea to rock Happily Inc�s wedding industry and win back her trust. Despite her reputation, Silver�s not as tough as she seems. Losing Drew nearly destroyed her. Still, his kisses are as tempting as his offer to invest in her business. If she can�t quite get over him, maybe she should get under him and knock him out of her system once and for all. But her best laid plans begin to unravel as Silver finds herself falling even harder than when they were high school sweethearts. Which means that she�ll have to come clean about the secret she�s been hiding from him for years�and risk losing him forever. Re: Can two high school sweet hearts find their own happily ever after? services for writing and homework assistance are much more useful.